It will start producing tiny volumes in Trinidad only next year, but already has ambitious offshore Ireland gas appraisal plans. Jersey-based explorer, Predator Oil & Gas, which listed on the London AIM exchange this May, outlined plans December 6 to explore and appraise offshore Ireland. 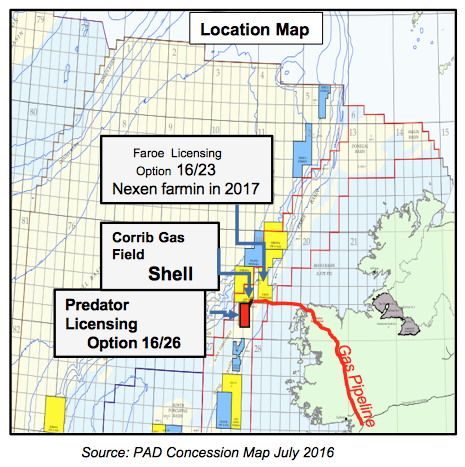 Predator said its application to convert Licensing Option (LO) 16/26 offshore northwest Ireland (Corrib South) into a Frontier Exploration Licence is progressing. During early 2019, planning will continue to prepare for drilling there in 2020, it added. The Corrib South prospect is 18 km from the Corrib gas field. Shell recently completed the sale of its 45% Corrib interest to the Canada Pension Plan Investment Board (CPPIB), which is transferring operatorship of the field to Canada’s Vermilion. Predator has also applied to extend the Ram Head LO 16/30 offshore southern Ireland for 12 months from November 30 2018, adding that it recently completed a study of the development potential of the 49/19-1 gas find made in 1984 by US firm Marathon. The study said a 10-well development could produce 1 trillion ft3 over 11 years; it aims to re-enter a first well in 2020. Last week Predator said it shortly expects to be formally awarded the Guercif permit onshore eastern Morocco and said December 6 that talks have begun with a drilling contractor that would drill up to 14 development wells, subject to approvals; the area is close to the Sound Energy-operated Tendrara gas development. For now though, tiny Predator has no production anywhere but says it is gearing up for initial production onshore Trinidad in first half 2019 at a rate of just 318 and 392 b/d.